Mounts to the ROHN 55G Tower at any Horizontal Brace. This Guy Assembly is used to attach guy wires to the ROHN 55G tower, distributing forces to the entire ROHN Tower instead of just one leg. It is recommended as an Attachment to a ROHN Tower Section for use at every guy level. The 55G tower can be used guyed, self-supporting or bracketed configurations according to specifications in the ROHN catalog. As a guyed structure, it can rise to a maximum of 400 feet. 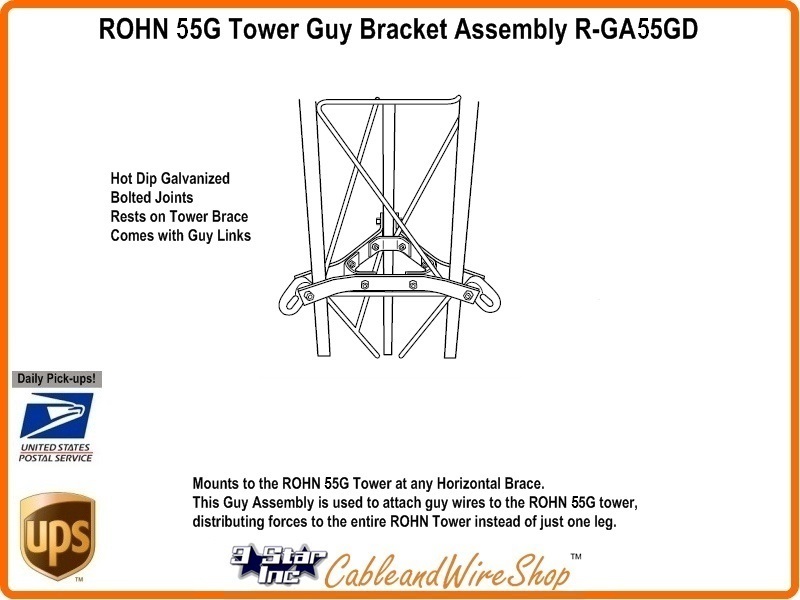 Consult ROHN Catalog Links at Footer Section below for ROHN 55G Tower Details. Note: This Guy Bracket is an essential part of your ROHN 55G Guyed Tower Installation. Install the Guy Brackets at Heights indicated by the ROHN Catalog (Link above) as per REV. G or REV. F Wind Load Ratings. Trust No Substitutes. Buy ROHN. Buy American.